I'm at a cocktail party with the ladies that I had met at the BMW Performance school. Supposedly, celebrities are also coming to this party. First Ann Coulter shows up and I'm not impressed. Then Ayn Rand shows up. I definitely want to meet her. But there is a huge line and I am holding someone's baby. The baby is a boy around 18 months old. He is round and solid, but pretty happy to be held by me. He is half Asian and is the son of a Japanese woman there. I listen in on the people talking to Ayn Rand and I see Ann Coulter actually go up to her and say that she was a huge influence on her life. Ann Coulter reading Ayn Rand? You've got to be kidding me. How could I have something in common with that piece of trash? People come by and ask whether I'm in the "receiving line". No, no, I tell them, I've got to hold this baby right now. Finally, I notice that no one is in line anymore and the baby has fallen asleep in my arms. I look at the baby's mother, motioning whether she wants to take him, and she simply motions to just put him down somewhere. I find a spot on the couch to put him. The couch is a day bed with a quilt covering. I see that he likes his legs tight against his chest, so I lay him down on his side so he can keep his legs curled up. After I'm satisfied that he is in safely on the couch and won't roll off, I leave him. I walk into the kitchen to find Ayn Rand. She looks very stately and almost larger than life. In her hands, she has a tea cup filled with coffee, but there is a lid that is still on the tea cup. A man in the kitchen tells her that she can't drink the coffee with the lid on. She immediately takes the cup and throws it against the wall with a triumphant look on her face. I think this behavior is kind of odd, but I let it go. Ayn Rand walks away from the party and I watch from a window as she wanders into a park. I'm looking down at her and she looks very small, like she is a toy that is about 6 inches tall. I see her lie down in a small square clearing lined with wood railroad ties, that just fits her body. She looks like a little stone statue. Suddenly I realize that she is indeed a stone statue. The statue rolls a little bit and there is a frail old woman underneath. The real Ayn Rand was just tiny woman hiding inside the stone facade. I realize that at the party, her stone statue was being controlled by strings like a marionette. When she threw her tea cup, it was the puppeteer doing it and not her. But why did she need to hide inside the stone statue? She was frail but still beautiful. It could've been worse, he could've read Dianetics or something. 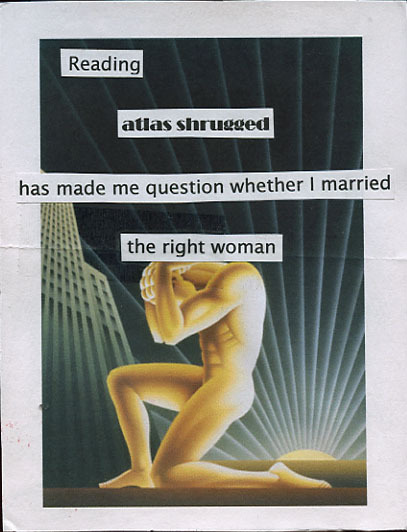 Reading Atlas Shrugged gave me the strength to pull myself out of an eating disorder; it saved my life. The puppet analogy was in reference to updating this 6-year-old post on the puppeteer Igor Fokin last week. I read Ayn Rand's The Fountainhead shortly after Adam was born. My friend Claire had given it to me years ago, but I slowly plodded through the first few hundred pages over the course of several years. She gave up on me, calling me a non-reader. Finally, when I was on maternity leave, I read the rest of 700 page novel while nursing Adam for hours on end. And then I read the entire thing again from the beginning. This was in an extremely small font, densely packed paperback. I have often thought about how I could have strove for individual greatness with my many talents, but have always settled for safe mediocre corporate jobs. I claim I don't have the creativity or the energy to create something great by myself, but in reality, I just don't have the guts. It's also interesting that I mentioned relating to Dominique instead of Howard Roark. For years I always assumed that I was supposed to aspire to Roark's potential and ideal. Looking at it nine years later, I can see that my life choices more closely follow Dominique. After this dream, I looked up Ann Coulter and Ayn Rand and did find references that "I've heard [Ann Coulter] revere people like Ayn Rand for her staunch right-wing idealism". Comments like this infuriate me because I believe that Ayn Rand is not a conservative. Anti-socialist does not equal conservative. Obviously this dream means that it is time for me to read Atlas Shrugged . 1200 pages here I come! I'm on a fishing boat at sea, and there is some explosion nearby in the water. My right leg is injured, there are lacerations on my thigh and calf. The salt water really stings in the wounds. I'm wearing faded red cutoff jeans, so rip off a strip from my left leg for a tourniquet. The denim fabric is really old, so it rips easily. When I go to tie the fabric onto my right leg, I notice that it's not really bleeding that badly, it just looks raw and swollen. I just tie the fabric loosely onto my thigh just in case I need it later. Then I noticed two baby whales on the boat. The were pretty small, about three feet long and apparently beached themselves on the boat after the explosion. Other people were trying to get them back into the water but they didn't want to go. I said that we should take them ashore for help and I would take care of them. I scooped them up into my arms, one in each, and they seemed to be happy. It was really nice to hold them, I could feel they were warm-blooded. I was pretty tired from my leg injury, so I laid down with them. I think they were cold, so they nuzzled up my shirt and settled on my warm belly. It was quite cozy. By the time we reached the shore of Manhattan, I picked them up in my arms again and searched for help. I got separated from the rest of the crew because they told me to turn right at an intersection, where they turned left. I saw a vendor selling blue and white plastic whale balloons. I knew I had to hide the whales from the police, so I decided that if I saw one, I would pretend that I was just another vendor hawking whale balloons even though these whales were grey and quite real, and not clear blue plastic. I did walk by a police officer without incident, even with my bleeding leg. I searched the throngs of people for someone that could help us. Then I noticed an older woman dressed in a long white coat talking with her colleagues. She was a marine biologist. I walked up to her and asked her for help with these baby whales. I begged her because their skin was starting to get dry. She was taken aback by the sight of us, but eventually agreed to help. She led us to a building and to a room full of showers. She was a little concerned whether the water was potable or not, but then felt it would be OK. I entered the huge shower stall which had stainless steel dividers and turned on the warm water. It felt really good. As the water filled the stall, I put down the whales. They were happy to be in the water again and rolled and frolicked around like seals. The woman said that she would take care of the whales from here and that I should get my leg tended to. I felt that the whales were safe so I left them. Observations: My leg injury was definitely from shingles pain. Usually the pain just wakes me up, but this time they were just part of the dream. I'm at home on a school day and I read a story to my daughter about this girl who makes magic muffins. When you eat them, there is a surprise inside, a bee. The bee will buzz around in your mouth and when you open your mouth, the bee will fly out. We decide to make our own magic muffins and just use a chocolate chip for the bee. They turned out to be golden brown overfilled muffins and I put them in a cloth-lined basket like any proper domestic hostess. All of a sudden I notice the time and it is 5:15pm. OMG, that is an hour and a half since we were supposed to pick up Adam at the bus stop. I ask my husband frantically about it and he seems unfazed. "Didn't you hear the phone ring?" Apparently it did while I was in the shower while the muffins were baking. "Is he stranded at the school? What's going to happen to him?" "Don't worry, Mr. Robinson will drop him off," my husband replies. And sure enough, a pair of headlights drive up our driveway. My son comes in the door and I immediately embrace him. "I'm so sorry we missed you!" I exclaim. "It's OK, mom" he replies and heads inside. I notice that Mr. Robinson comes in as well as his two girls who are older than Adam. It appears that they want to stay a while. "Thank you so much for bringing my son home, Mr. Robinson," I say with utmost respect. He follows me inside and I begin to worry that he he checking out our home to make sure that we don't abuse or neglect our children. They see the huge basket of muffins, and I tell them to help themselves. My dining room is much bigger than in real life and it is positioned differently in our house. There are a row of metal shelves with gleaming pots and pans on them to separate the dining room from the living room. Thankfully, the house looks respectable, and Mr. Robinson starts looking around. He goes upstairs and I worry that he is going to peek into my son's room which is completely trashed with Legos. I hope that he doesn't ding me for my son's sloppiness. Thankfully, he only peeks into my daughter's room and looks satisfied. Later that night, I'm in a town trying to cash in on some bottle deposits. I sit in front of a machine and feed it my cans and bottles. I leave the big two liter bottles for last and find that I can't get the last bottle to take. I keep trying and pushing and I get covered in a sticky purple gel. I look at the bottle and realize that it is not a soda bottle, but a huge squeeze bottle of Welch's grape jelly. I realize that I can't recycle this so I put it aside. I want to clean the sticky mess off my hands before I get my receipt, so I take some hand sanitizer from the dispenser on the wall and a bunch of paper towels to get my hands clean. A lady behind me starts to put her own cans into the machine and I tell her to wait, I haven't gotten my receipt yet. I quickly press the button grab my receipt with my hands which are covered in alcohol and leave. I get about 20 feet from the place and the lady runs after me with a copy of my receipt yelling, "It's you! You're the one who didn't pick up her son at the bus stop! You're not allowed to have that money, it's bail money!" OMG, I'm not sure what she is talking about. I start to run and she is yelling at everyone to follow me. Observations: I think I was too traumatized thinking that I had to remember a dream for a daily Avelox post. Obviously, neither my husband nor I would ever forget to pick up our son at the bus stop. And I never get the deposits back for my cans and bottles, I just recycle them. But two nights in a row with oversized muffins! I always make them normal sized. So no more promises on Avelox dreams unless I have a really good one. I'm taking a course of Avelox, and supposedly you can have abnormal dreams. This first night's dream seemed pretty vivid, but normal in terms of dream content, at least for me. I figure it is a good excuse to add more posts to this blog! It is wintertime and I'm at a work party which is on an island not to far from the hotel. With a few friends, I walk over to the party location which is held outside and covered with Christmas lights. As we get closer, I notice one of my co-workers putting finishing touches on an ice window. He's using a hose to spray a mist onto a cold surface, and when he removes the backing, it looks like a pane of glass, except it is made of ice. The ice window is amazingly clear and smooth but there are some ripples in it so you can tell it is ice. I look around and see many of these windows sparkling with the lights and all framed with fluffy snow like a collar. Some windows are square, some are round, some are tall and others line the walkway. I'm really impressed with his work. As we get closer, I can hear a band singing songs. It's not an ordinary band, they looks like three dimensional gingerbread people, not flat, but full-size people with oversized heads. They're singing a song that I know and we all start to sing along. Not only are they singing, they are making huge cupcakes and donuts with cream stuffing overflowing out of them. I think, I better not eat any of those. It seems like a perfect night and I look up and see that the sky is turning a beautiful dark blue. Against the snow frosted ice windows, it looks absolutely beautiful. I think, gee, I really want to take a photograph of this, but I gotta hurry and get my camera at the hotel, this blue color won't last long. I start to walk back, but realize that it will take too long, so I hop into a van that my mom is driving. My mom was driving in the right direction, so I stop paying attention. Suddenly, I see the party place go by and I realize that we are headed the wrong way. I say "Wait, you have to turn around!" She said "I can't right now." Suddenly we are heading over a bridge to another island. I see that she is running a GPS and I can see that this island is pretty small and you can make your way back around pretty easily. I tell her to take the turnaround, but she tries to and goes off in another direction. We end up on another bridge going to another island. I tell her to slow down, we need to retrace our steps. We are whizzing around the map, skipping from island to island until one of the roads becomes a boat landing and swish we are suddenly in the water. Great, now we have to rescue ourselves out of the water! But magically, the van floats. At this point, I'm tired of her driving and I take the wheel. I try to navigate the van back to shore. The van seems to run, very slowly, but it moves in the water. Once we get back to shore, I take the GPS and try to program the way back to the hotel. This GPS is strange, it opens into two screen left and right and it is very hard to control. I think I get the destination right, so I try the demo to see what roads it picked. It actually goes through a dramatization of the ride and I see the roads go by in fast motion. It comes to the edge of an island, and suddenly the car becomes a rocketship and flies over to the next island. Great, that's never going to work, this car can float but it can't fly! Now I gotta reprogram the GPS so that it doesn't do any flying routes. I'm still fiddling with the GPS when I awaken totally frustrated. Observations: The GPS was definitely like a Nintendo DS held sideways as you do in Brain Age 2 and that's what I was playing before I went to sleep. The whole route demo with the flying car looked like it was out of The Simpson's Hit and Run game. Definitely a lot of video game influences in this dream. In my dream, I wake up and go to my computer. I click on my Gmail and find that I can't log in. I quickly move over to my blog and see the whole layout is messed up and all the posts are gone! I try to log in, but I can't. Someone has hacked into my Google account and wreaked havoc on all my stuff! I'm at a loss to what I should do, should I call Google? Would they even give a flying duck? I am completely traumatized and scared. Who would do this to me? Always follow your dream, unless it's the one where you're at work in your underwear during a fire drill. I hear of a job opportunity as a tech writer that is about 40 minutes from my house. I take a bus there, get off and walk through what looks like an old European village. I reach the company and am greeted by the last tech writer that worked for my company. She tells me that I'm really going to like it here. I'm a little bit confused as to whether I'm there for an interview or if I'm starting the job. The brick building is a bit run down. The interior has peeling light green paint and dark red carpeting. I get tour of the facilities and then they want to show me my office. I say wait, I need to talk to HR. I'm pretty sure that I haven't accepted a job offer and they are acting like I have. First of all, I ask them, what's my salary going to be? It's got to be high enough to be worth giving up my job that is 15 minutes from my house. $175,000 they tell me. Wow, you want to pay me that much? And I would only have to be a tech writer? Sounds like a good deal to me. So I let my ex-coworker show me to my office. She brings me to a room which looks like a bedroom with windows to the outside. The room is large, about 15x15 feet, and has a closet but no furnishings. Looking from the window, I can see an old mill next to a stream, very picturesque. My first real office with a door. Her office is adjacent to mine in the interior of the building and doesn't have a window. I ask her were the bathroom is. She brings me down the hall and shows me a large bathroom with communal tubs. She says that you bathe in here and proceeds to draw herself a bath and climb in. There are several bathtubs which are made by half height tiled walls with a seat built in. You would be able to bathe and chat with the person next to you. I'm beginning to feel like this is not a workplace but some kind of commune that I can't leave. But it doesn't matter because I'm getting paid so much. Observations: I have been caught up in a blog writing contest that I had entered and it was the final night for voting. I also have spent the last week at work writing the on-line help for my software program. So for some reason I transformed myself into a well-paid writer in a commune! Recursive Dreaming: Waking in a dream, only to realize it is a dream.....huh? This was seemed to be a dream in a dream...or something to that affect. In my dream, I was asleep in this Bed and Breakfast that I am currently staying at. I on the futon couch in the living room....just as I had gone to sleep on. Then, at about 1:00am (in the dream anyways)....I woke up when my friend came into the apartment (B&B), and started looking around in the dark. I then asked how they had a key to this room, and she said they must have been the Superintendents of the building....which I felt OK about for some reason. I asked my friend if my daugher Kristen looked comfortable in the other room, and she said she had saw me first and hadn't peeked in there yet. Later on when I did actually wake and put my feet to the floor...this dream was clear and in my head....but what happened after I stood on the floor (in my dream) was no where to be found. I have no observation, except that I did to to sleep sort of lonely. I did think about everyone in my family, and my friends.....happy to have so many good people in my life. I suppose seeing my friend who traveled all the way to NYC made me feel good and less lonely...but the dream inside a dream was a new thing for me! I'm walking towards a high rise building, but it feels like my old dorm. I'm walking with a girlfriend and we are talking about guys. She off-handedly mentions that she saw one of my old boyfriends from college lately. Really? I ask. As I step into the elevator, she waves goodbye and says, Oh yeah, and I slept with him. Whaaa? The elevator takes off, and I can't remember what floor I need to go to because I'm so befuddled by her remark. I'm convinced that I'm on the wrong elevator as the floor I need to go to doesn't have a button. It must be an express elevator, but where is it going? I tried to hit any floor to get it to stop, but it overshoots the floor. Where is it going? I press the first floor again and it starts to go down. It overshoots the first floor as well and stops in the basement. I get out just to get out of the elevator. I manage to get back outside and notice that the river next to the dorm is no longer a calm river, but a huge waterfall. Everything seems quite out of balance. Observations: I had this dream shortly after reading this article on elevators (fascinating, worth reading all 8 pages). And a long time ago, I was driving with my SO and he mentioned that he had dated a friend of mine before he knew me. I got so flustered I missed my exit. I was on a tee at Ponkapoag Golf Course which looked like a combination of the 2nd hole on course #2 and the 14th hole on course #1. We were teeing off, and it was my drive. I tee'd the ball up, addressed it...then felt the ball was too high. I re-tee'd it up, addressed it.....then felt it was too high. I tee'd the ball up, addressed it...and the ball fell off the tee. It went on like this for about 1 hour.....and I never did get to drive the ball. I think I woke up frustrated. What this means, I do not know. It seems to indicate some hesitation I might have about doing something with them, but I just don't sense anything like that, so I am not at all sure.